What is it like to deliver love? Every Valentine’s Day, chorus quartets experience the excitement of delivering an expression of love with a Singing Valentine in four-part barbershop harmony. This year, we have three quartets ready for more loving deliveries. Our local women’s Harmony of the Gorge Chorus, and the men’s Wind-Masters Chorus are again working and singing together to deliver Singing Valentines in the Gorge on Valentine’s Day. Singing Valentines include two love songs, roses or chocolates, and a personalized greeting card with the sender’s personal message. This year the quartets will make deliveries in Stevenson, White Salmon/Bingen, Hood River Valley, The Dalles, Dallesport, and points inbetween. The fee is $35 for the standard delivery of a single rose or box of chocolates. A dozen red roses can be delivered for $65. Phon-o-grams can be ordered for $15 to any phone number in North America. Both choruses are 501(c)3 non profits. 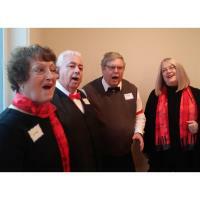 All earned funds from the Singing Valentines help to support a Gorge-wide scholarship program. Harmony of the Gorge and Wind-Masters Chorus are strongly committed to serving the mid-Columbia communities. In 2018, the choruses performed at the Discovery Center, SpringFest, Oregon Veteran’s Home, Down Manor, Parkhurst, Anderson Funeral Home, Flagstaff, Hunting With Heroes, Hawk's Ridge, Columbia Basin Care Facility, Fourth-of-July parades, Hood River’s First Friday, The Grotto in Portland, Christmas celebrations in Hood River and White Salmon, our shows in October, and more. Men and women who love to sing are invited to come visit the two choruses during their separate rehearsals which start at 6:30pm, every Thursday, in different rooms of the Hood River Valley Christian Church, 975 Indian Creek Road, Hood River, Oregon.